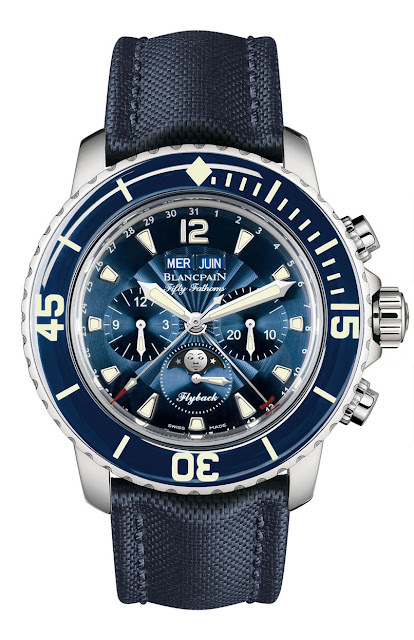 Blancpain’s Fifty Fathoms Collection is home to the most rugged sports watches in all of Blancpain’s lines. For 2010 Blancpain expands the Fifty Fathoms domain of sport to embrace the complications of a moon phase and a complete calendar married with the traditional sport companion of a column-wheel controlled flyback chronograph. This newest member of the Fifty Fathoms family, with its complicated 448-part movement, has been fitted with a host of Blancpain movement innovations. The moon phase complete calendar mechanism is drawn from the caliber F185 movement, offering the unique capability of risk-free setting of any indication regardless of the time of day or night. Other complete calendar moon phase mechanisms offered in the industry forbid setting of indications at certain times because of risk of damage to the delicate components of the calendar. Blancpain solved this problem with its unique design that frees the owner from worrying about whether it is safe to set the calendar indications. Setting itself is further facilitated by the incorporation of Blancpain’s patented under lug correctors that eliminate the need for adjusters on the sides of the case and which allow finger-tip setting in place of an adjusting tool. The chronograph base is Blancpain’s classic vertical clutch column-wheel controlled flyback movement. The stainless steel case is 45 mm in diameter and fitted with a blue colored sapphire unidirectional bezel and blue dial.